No matter your age, health status, whether you’re busy at work, or at home with the kids, modern life can make it challenging to properly nourish yourself on a daily basis. 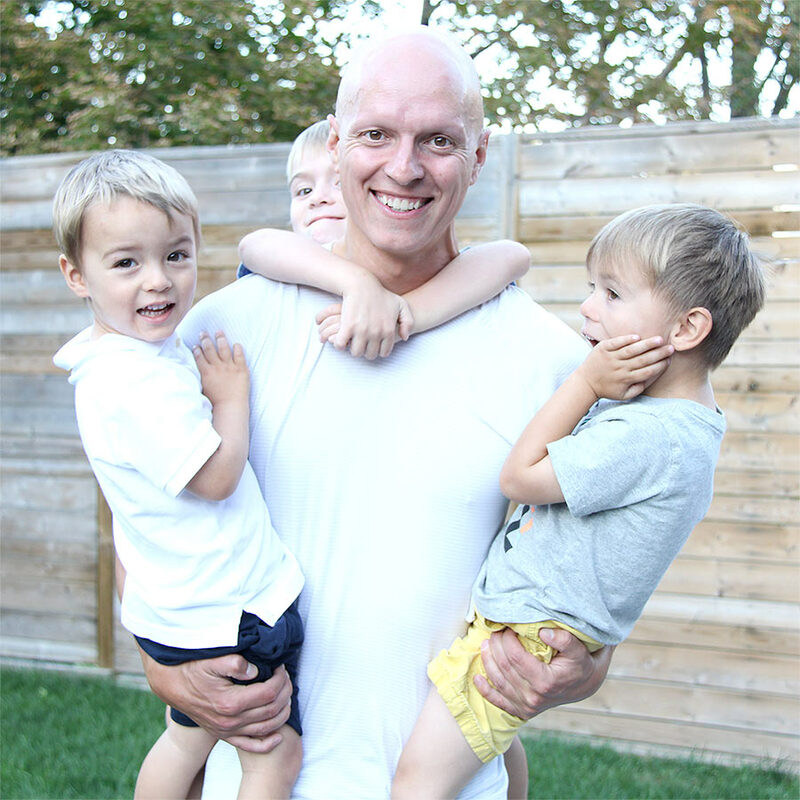 Energy Greens formulator, Yuri Elkaim, and his 3 young boys. 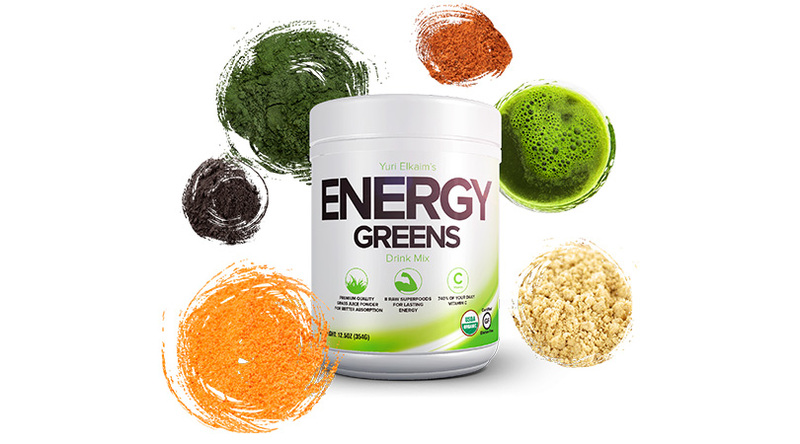 Energy Greens was created by our founder, Yuri Elkaim. However, for nearly 20 years of his life, he struggled with daily fatigue, skin and breathing problems, digestive issues, and more. That all culminated in a full-blown autoimmune condition, causing him to lose all of his hair when he was just 17 years old. All of this was a result of polluting his body for years with acidic, nutrient-void, inflammatory foods that wreaked havoc on his health. But that all changed (after 8 long years of searching) when he discovered, and experienced first-hand, the health-rejuvenating power of adding the right green superfoods into the diet. Since then, his health has transformed in a way he never thought possible. And so too have thousands of our customers all around the world who’ve followed in his footsteps. But most of us don’t like or have the time to eat pounds of veggies every day. That’s when many people turn to juicing and green smoothies, which are great, but between grocery shopping, blender or juicer set up, prep time, cleaning up, and everything that goes into it…there’s just not enough time in the day for most people. And, it can get really expensive especially if you’re using pounds upon pounds of organic produce each and every day. How do you ensure your body is getting its daily supply of greens instead of inundating yourself with unhealthy options while out of the house? It’s for these reasons, along with the fact that most other greens drinks taste awful, that Yuri spent 4 months developing a more convenient and tasty way to get your greens each day. A proprietary blend that is loaded with 8 of the world’s most nutrient-packed superfoods that are shown by science to transform your health, alkalize your body, and help you feel unstoppable. All in just 30 seconds per day! And with NO shopping, chopping, or messy cleanup required. Just add a scoop of Energy Greens to a glass of water or your favorite green smoothie and start feeling “unstoppable” so you can live your life to the fullest. Are you really getting 8-12 servings a day? When most people think about health, they think about eating a well balanced diet with lots of fruits and vegetables, void of processed foods, and low in sugar. And while that’s certainly important, there’s a missing piece to great health that is often overlooked by almost everyone. That missing piece is having the right balance between acid and alkaline foods. That’s because different tissues and fluids within your body need to maintain different levels of pH (acid-alkaline balance) to sustain life. Most notably, your blood – which carries nutrients and oxygen throughout your body – needs to be slightly alkaline. Too much acid in the body (known as “acidosis”) has been linked to many health challenges and can make you look and feel decades older than you really are. On the other hand, a balanced pH supports the body’s natural ability to achieve optimum health. Good health isn’t complicated, you just need to give your body the right nutritional tools and it will take care of itself. After growing up on acid-forming foods that drained his body and created a host of health problems, Yuri later learned about the importance of acid-alkaline balance. Eager to see its effects, he cleaned up his diet, started eating more alkaline foods, and within a few short days his health transformed. Since then, Yuri’s been on a mission to help millions of people understand this simple, yet overlooked (even by the medical community), concept that is so vital to our health. His New York Times bestselling book, The All-Day Energy Diet, is a culmination of these findings. It has gone on to help tens of thousands of people feel alive again! And it simply makes sense. 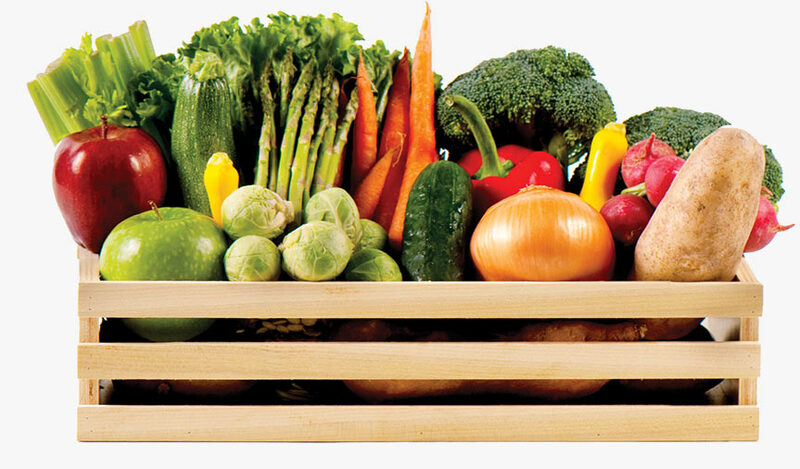 Alkaline foods are mostly vegetables and fruit. By eating more of them you not only get more micronutrients that your body requires to thrive but you also help your body neutralize excess acid that is caused by eating all too common acid forming foods. The modern diet is overly acidic. Processed foods, lots of animal products, sugar, and grains are all acid forming. Nowadays most people consume 10-20x more acidic foods than they should and infinitely more compared to our ancestors even just 100-200 years ago. 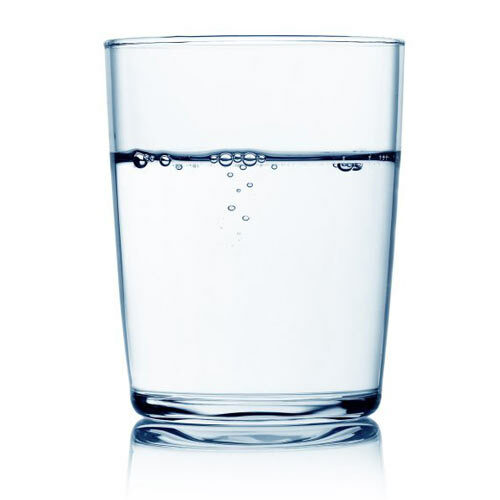 Inevitably, this upsets the delicate acid-alkaline balance that the body does its best to maintain. But unless you’re eating 8-12 servings of veggies and fruit each day, chances are your body is too acidic. That’s where supplementing with Energy Greens can help. It can help fill in the gaps and give you a flood of alkaline nutrients that can help rejuvenate even the most tired and unhealthy body. It’s not a magic pill but it can give you an unfair advantage to enjoy better health and more energy in just 30 seconds per day. 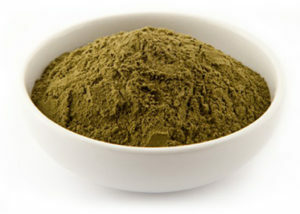 There’s no shortage of greens powders on the market. Most greens products on the market use cheaper grass powder by cutting then drying the whole grass. This results in a bulkier powder, which is cheaper, harsher on the throat and has less overall nutrient density because the vital nutrients are still locked inside the fiber, which hasn’t been broken down. By contrast, our Energy Greens uses premium GRASS JUICE POWDER where the grass is cut, then COLD PRESS JUICED, discarding the bulky fiber. This “juice” is then dried at low temperature to preserve the nutrients. This results in a richer, finer green grass blend that is 100% RAW and thus packed with a higher overall nutrient density. When you mix our Energy Greens in water it is vibrant green and looks alive and fresh and tastes that way too! It mixes into water beautifully and crosses your tongue with a velvety smoothness. This isn’t a standard run-of-the-mill greens powder that we’ve simply “private labeled”. This is a proprietary blend that Yuri created in his very own kitchen after 4 months of trial and error with dozens of raw superfood ingredients until he finally hit the jackpot and got the “taste approval” from his 3 young boys. Instead of stuffing undetectable trace amounts of 100s of ingredients into a powder, our proprietary Energy Greens blend gives you the full health-boosting impact of 8 of the world’s healthiest raw, organic superfoods so your body soaks up the nutrients like a sponge. 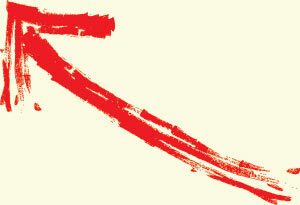 Each of our 8 ingredients is sourced from a cooperative of many small farmers. These small farmers and their ancestors have cared for their land for centuries, cultivating traditional foods without chemical pesticides or fertilizers. You could try to take each of these superfoods on their own but not only would you not have access to our same premium sources, they’d be 10x more expensive, and you wouldn’t benefit from the synergistic power they provide when combined as they are in our Energy Greens blend. 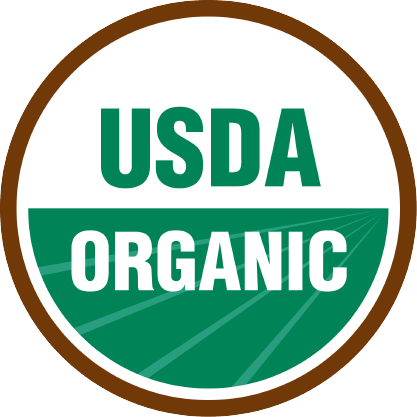 Each ingredient is 100% USDA Certified Organic (as tested by ProCert) so you can rest assured you’re not ingesting needless pesticides and other poisons. Each ingredient is also 100% raw thanks to our unique “flash-freeze-dry” process that preserves all the vital nutrients that would otherwise be ruined in traditional heat-based processing. 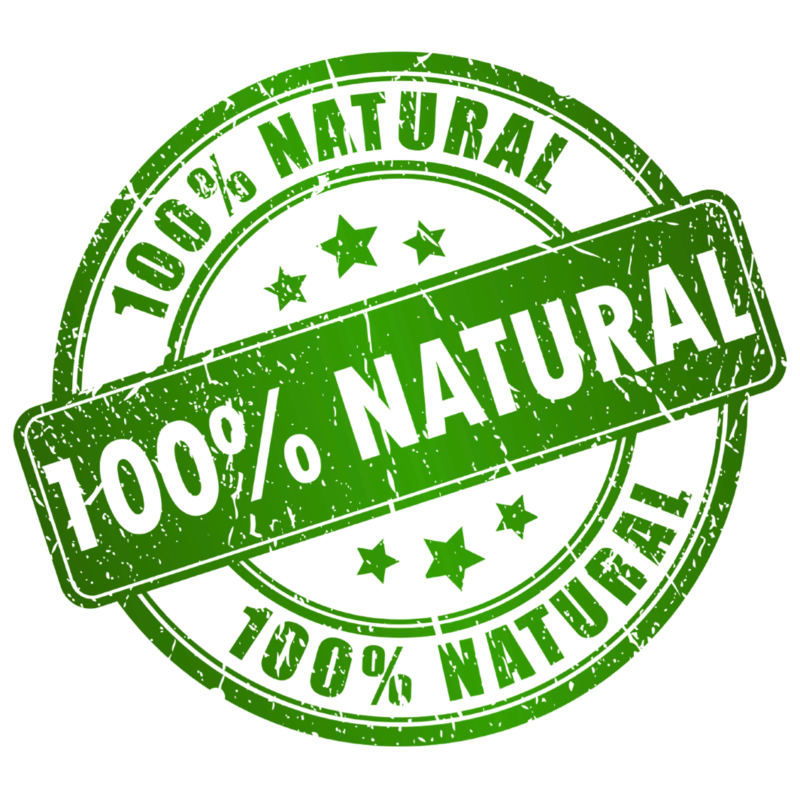 That’s because the barley grass we use is harvested before gluten is present in the grass, leaving you with a finished product that is 100% organic, raw, gluten-free, and contains NO artificial flavors, colors, preservatives, sweeteners, fillers, or stimulants. We firmly believe in delivering the freshest superfood blend possible to your doorstep. That’s why your Energy Greens will never sit for months on end to die a slow death in a warehouse. Each bottle has roughly a 2-year expiration, yet we only produce small batches every 6 weeks to ensure that what you get is as fresh as possible. We understand most green drinks taste like pond water or fresh-cut lawn. That’s one of the reasons why we created Energy Greens. To get his 3 young boys to approve of its taste. Thankfully, they LOVED it and with their stamp of approval, we knew others would love it as well. Since then, thousands of customers around the world have raved that Yuri Elkaim’s Energy Greens are the best-tasting greens they’ve ever tried. But if you’re looking for something that tastes like Kool-Aid – this isn’t it. Our Energy Greens isn’t masked by artificial sweeteners, mint, or other odd flavors that make you feel like you’re drinking liquid candy. Its natural sweetness is provided by the aromatic flavors of cinnamon, vanilla, and goji berry, not sweeteners (like stevia) that leave an artificial and lingering aftertaste. 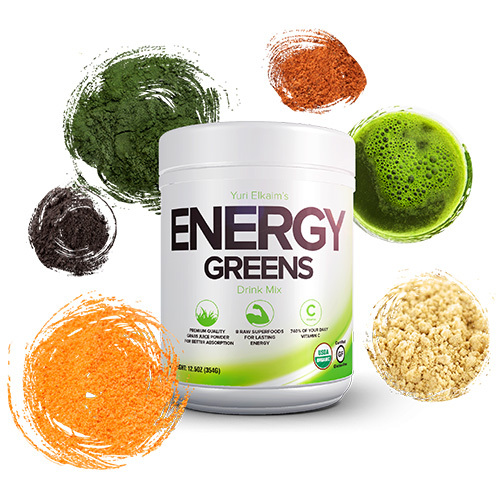 Plus, Energy Greens isn’t gritty like most greens drinks. It’s smooth and mixes into water beautifully so that it crosses your tongue with a velvet, silky-like texture. Finally, you can wake up each morning and look forward to drinking your greens. They taste great and they make you look and feel great too. 8 of the World’s Healthiest Superfoods – All in One Glass! Each of the 8 superfoods we’ve included in your “Energy Greens” is sourced from a cooperative of small farmers from around the world who grow their food in sustainable and organic conditions. Each ingredient is grown in the most pristine environments and harvested when its nutrient profile is highest so that you get the most bang for your buck. Minimal processing and close attention to detail ensure that our 8-ingredient green superfood blend arrives at your door as fresh as possible resulting in a drink mix that is 100% organic, unprocessed, raw, and absolutely delicious that you can enjoy with water or added to your favorite green smoothie. No Fillers. No Sweeteners. No Shortcuts. 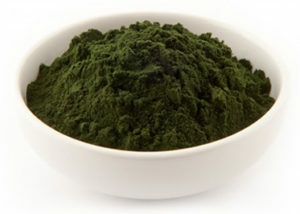 At 60% protein per serving, spirulina is the highest source of protein on the planet and contains all 8 essential amino acids, detoxifying chlorophyll, the essential fatty acid GLA (which is great for balancing hormone levels), plus B vitamins and trace minerals. Sadly, to save money and cut corners, some companies use a lesser quality spirulina, which can often originate from contaminated sources. Thankfully, we don’t. Your “Energy Greens” blend contains only spirulina that has been carefully sourced and purity tested for heavy metals to ensure it’s healthful and nutritious… not a potential hazard. 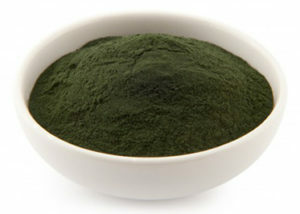 In fact, our spirulina has less heavy metal residue than most organic vegetables! 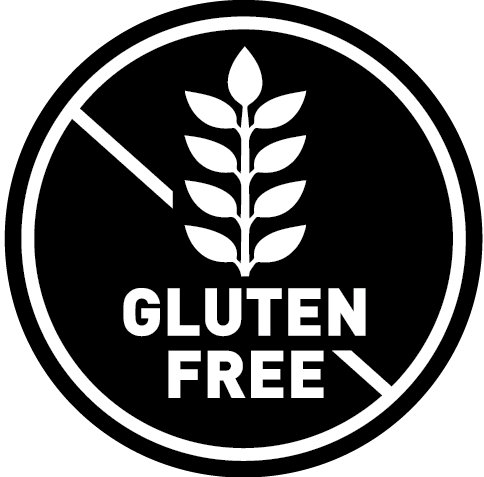 We guarantee that it is completely free of toxins or bacterial contaminants and contains no pesticides, herbicides or preservatives. Organic cracked-cell Chlorella, a complete food with a host of health benefits ranging from detoxification to immune support and more. And the world’s #1 source of chlorophyll. 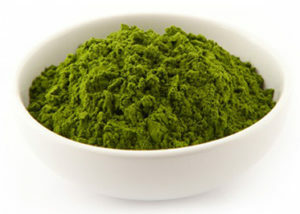 Chlorella is a single-celled freshwater plant that many experts regard as “a complete food”. Our chlorella is grown in carefully controlled production ponds to maintain purity where it’s able to harness sunlight into energy and nutrition to fuel your body. 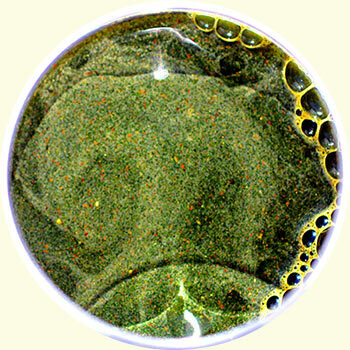 Because it keeps all its valuable nutrients locked up inside a hard-to-crack cell wall, our chlorella is “cell wall cracked” to maximize digestion and absorption using an ultrasonic method that maintains the integrity of the nutrients, followed by spray-drying process that flashes it into a powder in 2 seconds. Alfalfa is an alkalizing plant as it helps counterbalance excessive acidity in the body, which leaves you feeling great and helps you lose weight more easily. It’s also been shown to reduce arterial plaque, lower LDL (bad) cholesterol levels, and may even help reduce the effects of diabetes. It is high in chlorophyll… high in antioxidants…has 4 times as much vitamin C as citrus fruit…and has numerous properties that benefit your immune system, kidney function and health. Not only is the 3rd leading source of chlorophyll on the planet but, according to the Institute for Preventive Medicine, organic barley grass juice has demonstrated the ability to DOUBLE the speed at which DNA repairs itself! When barley grass is young and about 12 inches high, it contains all of the vitamins and minerals necessary for the human diet ‐ that’s when we harvest it! Its resulting juice is 7 times richer in vitamin C than oranges, 5 times richer in iron than spinach, and 10 times richer in calcium than milk. With a long history as a traditional Chinese longevity food, goji berries are one of the world’s richest sources antioxidants and essential vitamins and trace minerals, including selenium which is vital for healthy thyroid function. They’re also loaded with heart-healthy phytosterols and eye-sight-protecting carotenoids, as well as goji’s unique polysaccharides, which are responsible for improved immune system function. The goji berry juice powder used in your Energy Greens come from goji berries grown exclusively in the mineral-rich soil of a pristine Chinese valley, which has been nourished by millennia of floods from the famous Yellow River, and then hand-picked at the peak of ripeness. 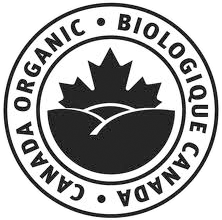 Our farming partners take pride in producing an exceptionally high-quality product. To add a wonderful flavor to our “Energy Greens”, we’ve added only the best raw, organic ground vanilla bean, grown organically in sustainable, fair-trade worker cooperatives, hand picked from the blooms of the vanilla orchid and cured in the sun. 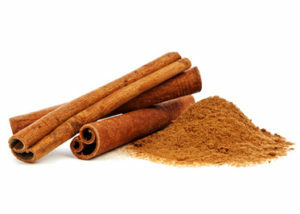 Cinnamon’s unique healing abilities come from three basic types of components in the essential oils found in its bark. These compounds have been shown to have anti-clotting and antimicrobial activity. Cinnamon is most famously known for its role in stabilizing blood sugar, making it a great spice for diabetics and non-diabetics alike. 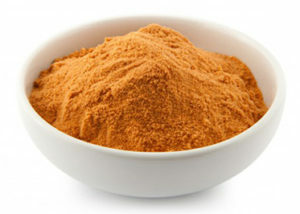 Because of its role in reducing rises in blood sugar, it’s an important spice to any weight loss/maintenance regime. And it tastes and smells great too! Maca is a mild-tasting premium organic adaptogen, similar to ginseng, great for energy, recovery, libido, and stress-busting. 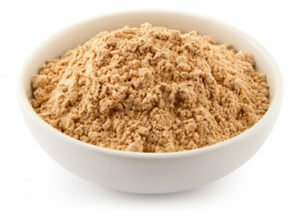 We’ve included only the best maca the world has to offer because of these properties and because of how beneficial it is for rebalancing hormones, especially in women, and for its sexual performance improvement among men. We only use a premium maca that is organically grown in a region totally untouched by modern chemical farming techniques or polluting industrial activity: the pristine Junin valley of the Andes mountains, 14,500 feet above sea level. When Your Energy Weans, Drink Your Greens! So, how do you benefit from the power of Energy Greens? It’s simple. Just add 1 scoop of Energy Greens to a glass of water (or smoothie) each morning and/or mid-afternoon to help you avoid those dreaded energy slumps. 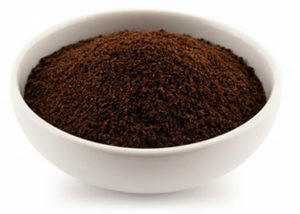 After just a few days, you’ll enjoy lasting energy instead of riding the “up and down” energy rollercoaster that you get with coffee and caffeine. “Hi Yuri, I was a little nervous to try your Energy Greens Mix at first since it was a completely foreign to me. But I’m glad I did because the taste is very nice and at 80 years old I have more energy than ever with just one glass each morning. 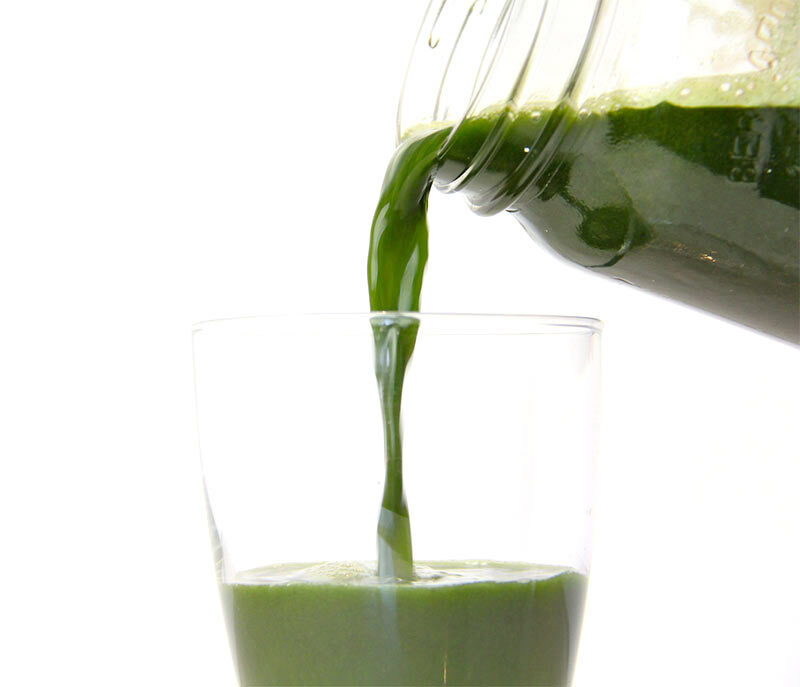 Chlorophyll-rich, alkaline ingredients clean up the junk inside and bring your body back into balance…and back to life! Less acid, and a more alkaline environment, means less need for “stuck fat” to linger. The blood purifying power of our deep, dark greens improves the health of your blood, making oxygen delivery throughout your body effortless. 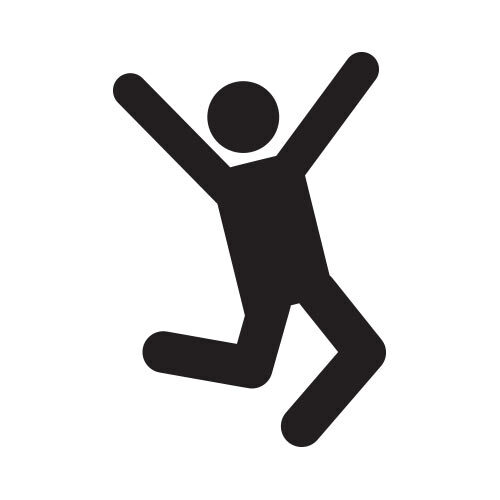 The more oxygen your cells receive, the more readily they can produce lasting energy. When you are travelling or don’t have time to juice, grab your Energy Greens and you’re set to go. As your body goes from acidic, inflamed, and stressed, your metabolism begins to reset itself. This allows your hormones to work as they’re intended to. Add the power of hormone-balancing premium maca to the mix and you’ll feel years younger and feel at home in your body again! A recent study in the journal Appetite found that consuming ingredients found in our Energy Greens accelerates weight loss, improves obesity-related risk factors, and reduces the urge for “junk” food we so often crave. As your body (internal) is cleaned and purified, your skin will reflect that. Your family, friends, and colleagues will likely ask you for your secret. Infusing your body with countless trace nutrients found in our Energy Greens supports healthy immune function and bulletproofs your body so that you can stay well even when others around are getting sick. We’re on a mission to transform the lives of more than 100 million people by 2040. And we believe that our Energy Greens can be a powerful catalyst in making that happen. By giving you a nutritional boost to a healthier, more optimized version of yourself, they can help you better handle anything that life throws your way. And since drinking your Energy Greens each day creates a positive and healthy habit, you might even feel more motivated to eat and live healthier on a regular basis just because you love feeling so good! It’s truly a wonderful “snowball” effect that can help make your future so much healthier than you thought possible. We want to help you feel unstoppable so you can live your best life. If our Energy Greens can play a small or large role, then we’d be delighted.